A dope thing about skateboarding is that it attracts an endless variety of people, who are each drawn to it for their own specific reasons. We all have our unique relationships within skateboarding as far as what we want to do, who we want to be around, and where we want to go on, with, or because of them. John Gardner’s motivations on a skateboard are not so easily pigeon-holed, though it can be said that he’s not adhering to any sort of trends in attire, trick selection, or really, well anything. It makes one wonder whether he even needs a skateboard. Like, if the skateboard were never invented, I feel like John Gardner would figure out some other vehicle to sate his physical and creative urges. This points to part of what makes him such a delight to watch. 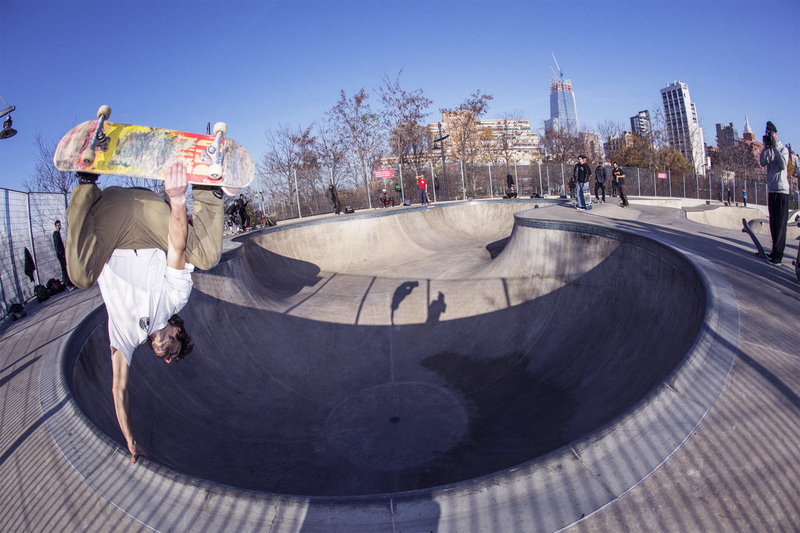 For some people, skateboarding is what creates their identity. But for John, the skateboard is just an accessory, one of many mediums lending themselves to his way of life and creative pursuits. Without the board, he’d be no less extraordinary, but as skateboarders, we couldn’t be more fortunate to have him as a member of the club. To start…the video part. It was just a pleasure to watch. Give me a little overview. I had a bunch of VX footage that was just kind of sitting around, and I had always wanted to make music for a video part but never really had an opportunity to do so, so I immediately connected the dots and thought that this would be a great opportunity to make that happen. It’s over the course of two-and-a-half years, whenever a VX came out. Some of those clips might even be three of four years old. A lot of it is in California with some Jersey sprinkled in between. Tell me about the soundtrack. My friend Max Hersteiner, who I used to live with, is in an amazing band called Dirty Fences — he’s in a couple bands actually, Dirty Fences and Metal Leg. He and the bassist of Dirty Fences and Metal Leg, Max Komaski, all created music together for various video projects that I’ve made, so I hit those dudes up immediately to just jam and see what we came up with. Max’s friend Danny Cooper played guitar for the soundtrack. We just set up a camera, experimented and that’s what we came up with. What’s up with your uncle? My uncle is a wild man. He is my uncle Semo, my dad’s brother. He has a lot of upper body strength and is really good at doing handstands. He would walk up and down stairs on his hands when he was younger, so he naturally gravitated to riding a skateboard on his hands. I had a camera and wanted him to be in this little video that I was making, so we drove around looking for a little hill and filmed him doing his thing and that’s what I got. He loves skateboarding and he really tries but he skates better on his hands than I would say he skates on his feet. I’m from all over New Jersey but I claim Whitehouse, NJ. Even though I’ve never lived there, I’ve lived all around there. It’s in Hunterdon County, about an hour and twenty minutes west of New York City. When did you find skateboarding? I found skateboarding at Extreme Skatepark in Bridgewater, New Jersey in third grade. It was at a family fun night that was hosted by my elementary school. I dropped in the first day. It was the best night of my life. How long was it until you got a skateboard after that? During that time, I was a wrestler and that took up a good majority of my time, but it was slowly becoming something that I didn’t enjoy. Not long after that, I decided to quit wrestling and skateboard full-time. What was it that deterred you about wrestling? I liked wrestling because it gave me an adrenaline rush, it was really fun, the people I was wrestling with were cool, and my dad really enjoyed watching me. My uncle was a state champion wrestler and I feel like my dad was living vicariously through me, so I really enjoyed spending so much time with him and also doing something active. Soon after that, it became more of something I didn’t look forward to doing — having to go to practice over hanging out with my friends. I didn’t like answering to anybody to express myself. You know how people will talk about someone like Cardiel doing backflips off stuff long before he even skated? Are you a thrill seeker in that respect? Did you have a lot of energy growing up? Yes. I was also one to try and do backflips off things. But yeah, I really took to skateboarding because of that thrill aspect. It made my heart beat in a way that nothing before had ever done. Who and what caught you up to speed on tricks and videos? 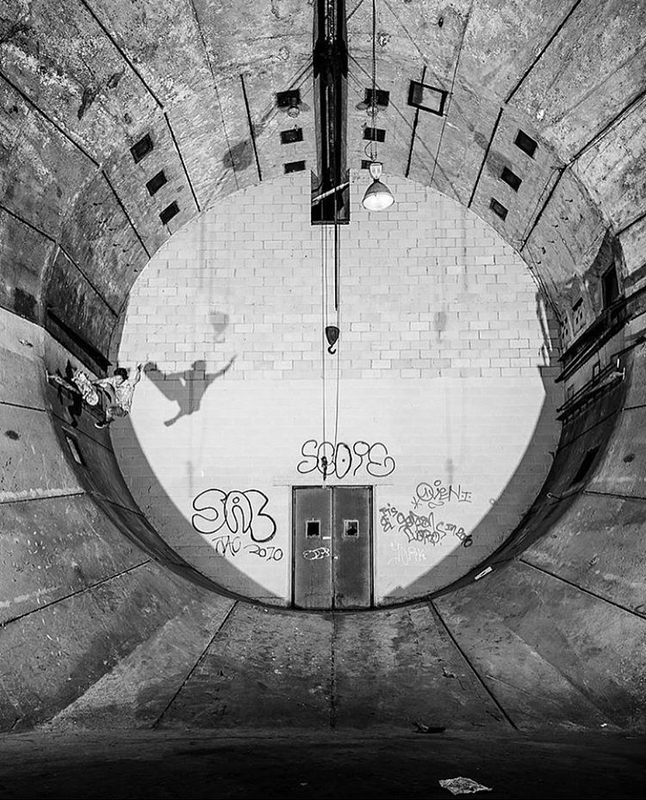 Where would you skate growing up? The first couple years that I skated, I went to Extreme Skatepark, then that closed down. Then me and my family moved closer to Whitehouse, to a town called Califon. There’s a skatepark in Flemington called Shields Skatepark, so I went there every chance I could get. That was pretty much where I met all my friends who I skate with now and where I learned to skate. Is that where you got so good at transition skating? At first, that was all I was skating. I didn’t have anybody to skate with so I just put on a bunch of pads and messed around on the miniramp. I gravitated toward transition skating, then the more I learned about skateboarding and the more people I met within the skate community, it just opened me up to everything else. I don’t know the exact moment in time, but I remember my friend brought a camera to the skate park. When the skate park would close, we would go around to different spots around the skate park and film random clips. Are any of the people who you were skating with then people who you still skate with? My best friend at the time was a guy by the name of Mike Sisara and he was a huge influence on me street skating-wise because he had the camera, he had the spots, and we hung out all the time. I would skate with other people from the skate park and then our crew slowly started to evolve and grow. I was starting to go out with Jordan and Zach Gesko, Andy Enos who shoots photos, and then soon, my friend Kevin Winters who was the filmer of the crew. So pretty much everybody who I skated with when I was younger I still skate with to this day. I did. I went to SVA in Manhattan for film and editing. I have a Bachelor’s degree. Did you spend most of your time in the city? During those years I spent all my time in the city. It’s unlike any other place in the world. The energy and the vibe of the city just took all of my attention, just like skateboarding did when I first found it. You were away for a while, huh? I was away for about two years. I really needed some change after school. I really wanted to explore skateboarding more. So I decided to build out my car and move to California. I built a bed and a little platform for a cooler in my car. I built a sliding stove top that I could cook on and various compartments for storage and things like that. It was the perfect home on wheels for a little while. So that was just where you lived for two years? Not two years straight. On and off. I came back to Jers for a little while, would sleep on couches, stay at friends’ houses, but my car was my homebase for two years. It was an amazing experience. I went to California and made a lot of friends, skated a lot. I worked doing food delivery in my car. Went up and down the coast skating with whoever was around to skate with. Just seeing what doors opened in that time. I would go to San Diego and hang out with Darren Navarette, who I was a huge fan of for a long time and now I’m blessed to be able to call him a friend. When did you get on Creature? I’ve been riding Creature boards since like 2009, 2010. I was getting flow through NJ Skateshop for a long time. It kind of fizzled out, I didn’t really know anybody and I would just get boards where I could get boards. Then I met Darren on the east coast and he was kind of my open door into the Creature community. Yeah, I am certainly an environmentalist. I’m vegan. I think a lot of that has to do with environmental issues…the animal agriculture industry is the biggest contributor to global warming. So the way I see it is, if I don’t support that industry, then I’m doing my part as an environmentalist to take care of Mother Earth. But there are many instruments in the symphony, so to speak. Just take care of the planet that takes care of you. When you told me that you wanted to make the music for your video part, I compared that to Matt Rodriguez, who you said is your favorite skater. Yes, that’s correct. When I watch him skate, it looks like a dance. He’s flowing with his environment. That’s one thing I’m really attracted to in skateboarding. Flowing with my environment and expressing myself on the different architecture that I come across. I’ve always had a desire to make music, but for the longest time, I couldn’t really find an instrument that I gravitated towards. I tried drums, and I wanted it so bad but I didn’t want to actually take the time to learn. Same with bass, you know, I’d learned a little bit but it didn’t really hook into me. Then one year, my mom got me a Native American pocket flute for Christmas, and I played that thing so much. I wanted to know everything about this instrument, how it was made, how I could play it, what other kinds there were. 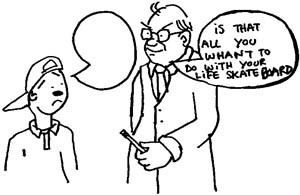 What are some of your motivations on and off the skateboard? What motivates you to create? This is going to sound a little bit morbid, but what motivates me is the thought that one day, I’m going to die. That people die, and that’s a natural cycle of life. So while I’m alive, I better get busy living. Okay, so, now you’re back on the east coast. Yeah, I drove back from California in April. Then as soon as I got back I flew back to California for a Creature trip where we drove across the country promoting a video that we made. Then I moved to Brooklyn July 1st, with Tony Farmer and Jesse Alba. What are your plans for the immediate future and beyond? To try to continue to ground myself in the present moment and surrender to whatever the future holds for me. Actively, I’m trying to create in many different mediums, skateboarding and beyond, and looking for a job that will bring me fulfillment and peace and help Mother Earth in some way, shape, or form. I would say that it’s an attainable goal for me.